This review was written by my good friend Tim Gallant. 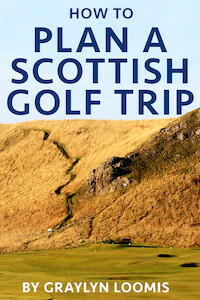 Tim is an avid golfer living in Edinburgh, Scotland, who boasts North Berwick as his home club. 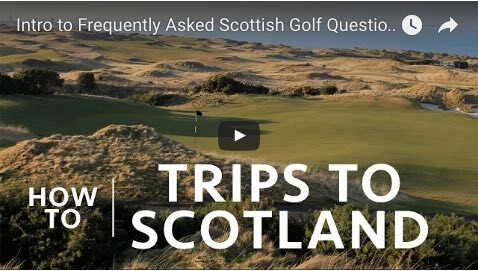 We have played rounds together across Scotland, England, and the U.S. comparing notes and debating designs along the way. Tim is a real student of the game – enjoy his review and reach out to him on Twitter at @tdgallant. 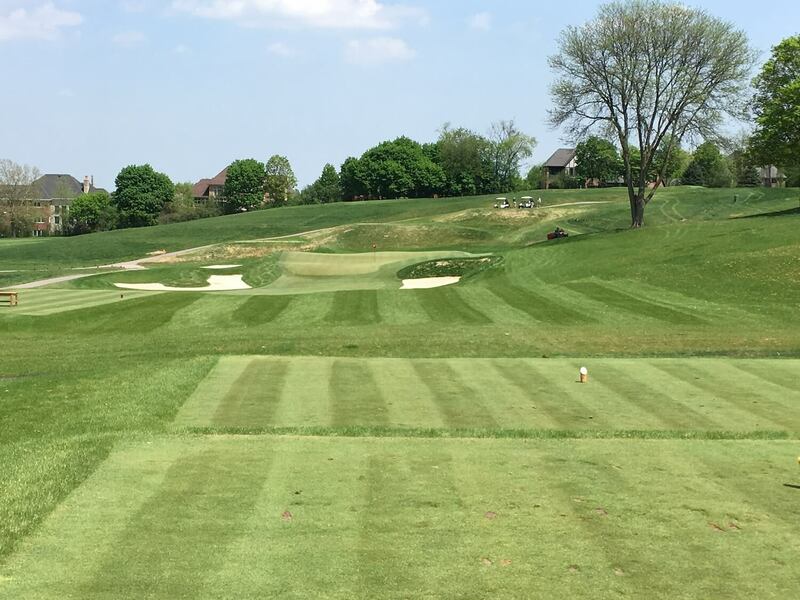 Recently, the stars aligned, and I was able to take a golf trip to the U.S. to check out a few fantastic golf courses in Pennsylvania, Ohio and Michigan. Each day it felt like Christmas morning as I was able to see the works of noted architects such as Fownes, Ross, Dye, and Mackenzie. 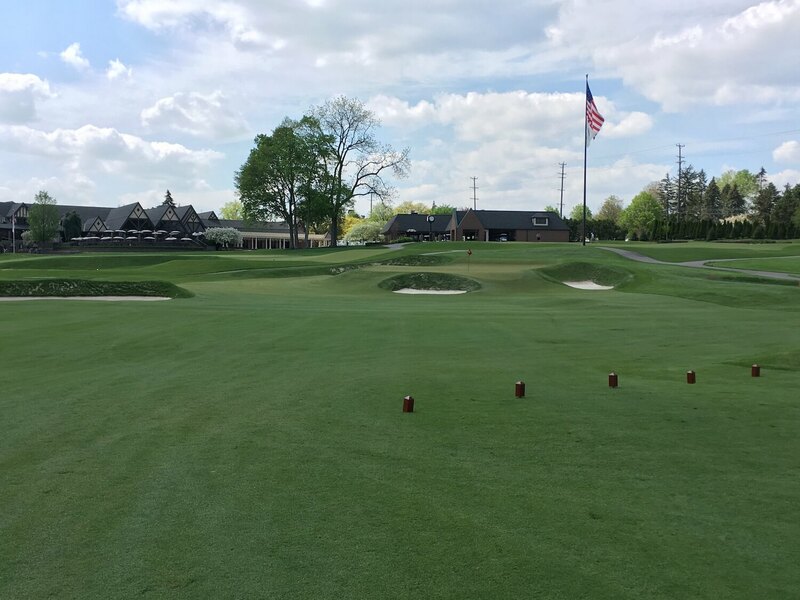 However, in between these courses, I was able to see a course outside Detroit that blew my socks off: Meadowbrook Country Club. 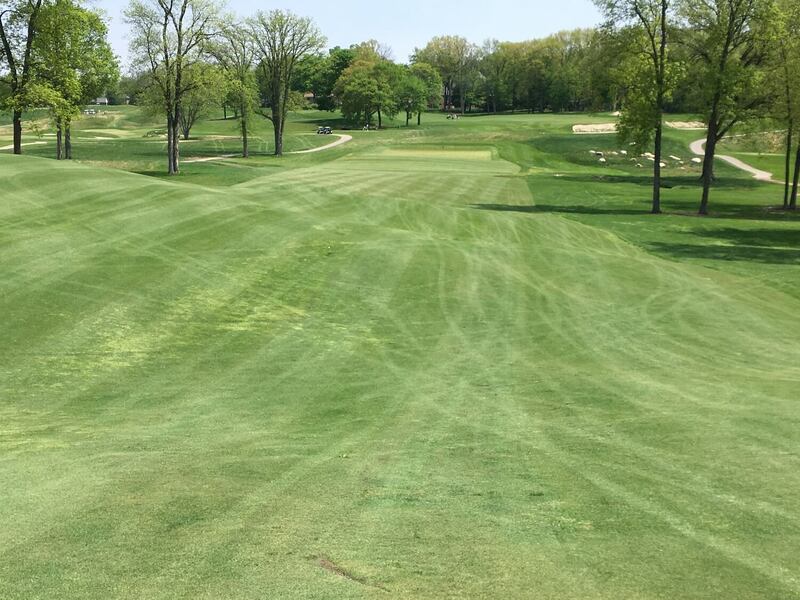 Opened in 1916, Meadowbrook was originally designed by Willie Park Jr., who, in addition to designing courses such as Maidstone and Olympia Fields, was also a wonderful professional player, having won The Open Championship twice in the late 19th century. The course opened with just six holes, but was later expanded to 18. 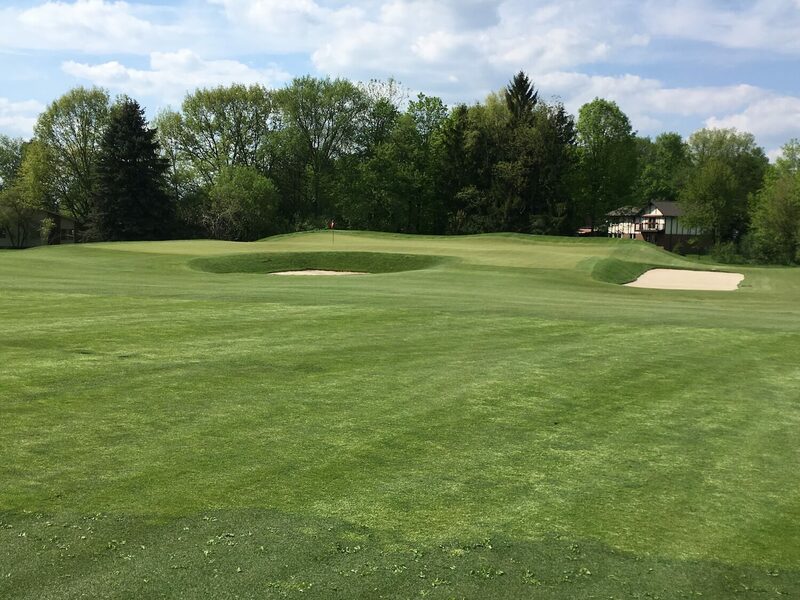 However, over the years, the course appears to have lost its way, with tight, tree-lined fairways uninspiring bunkers, and shrunken green pads. 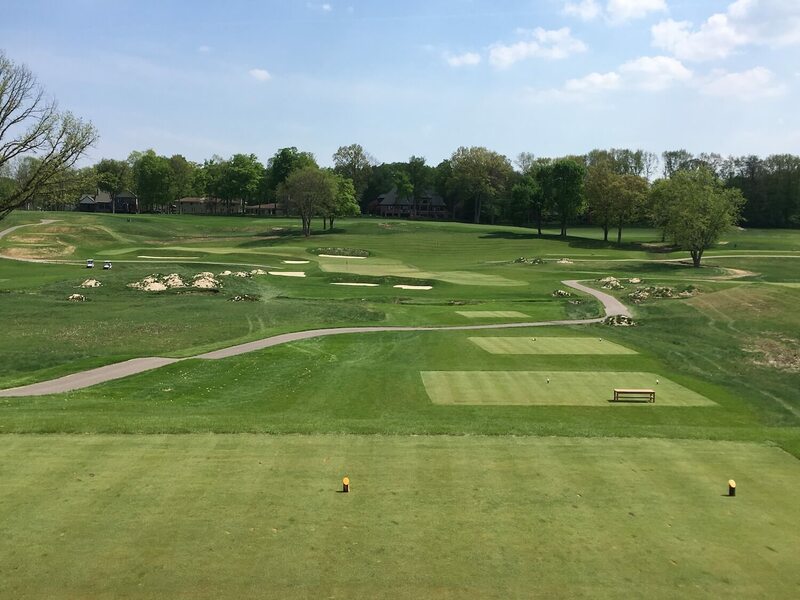 Looking at photos of the “Old” course on the Meadowbrook website, it certainly doesn’t look much different from a thousand different golf courses around the world. Starting in 2012 Mr. Andy Staples helped the club put together their centennial plan for the golf course, which, according to his website, was “focused on restoring this course to its inaugural glory while embracing modern course architecture.” Staples went on the oversee the full restoration of the course based on Park’s original design principles. 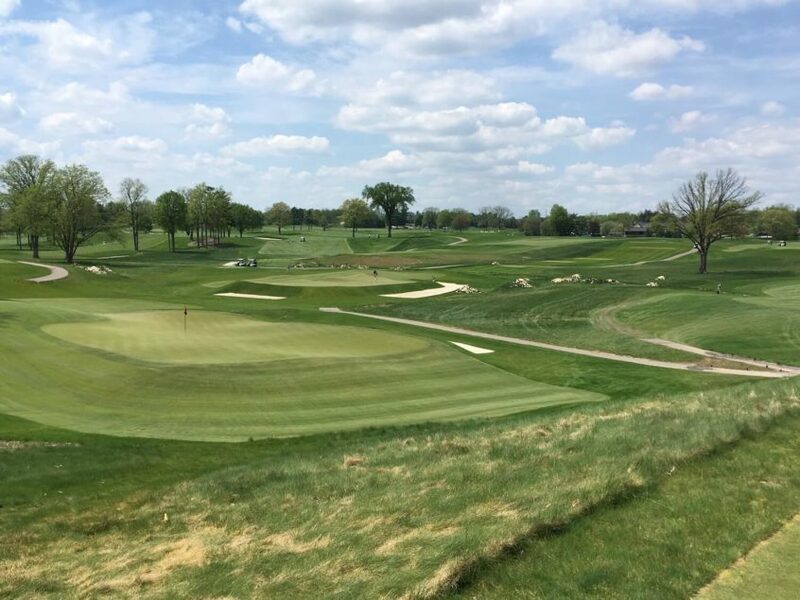 The course reopened in 2017, and what is on the ground now deserves to be considered among the very elite courses, not only within the state, but within the entire country. It is as inspiring as it is fun to play. Having already played 18 at a nearby course the day I saw Meadowbrook, I wanted to head straight back out. Each green felt like a breath of fresh air. Every bunker felt perfectly placed. Every fairway rolled as firm and as fast as those that I have seen in the British Isles. Every hump and hollow, every rise and fall, every valley and peak felt like a joy to discover and traverse across. In short, it was a revelation of all that I love about golf courses, and I wish I lived closer to play it more often. Before I begin the tour, I’ll leave you with a quote from my host who summed the course up perfectly. He said, “It’s essentially a brand new course, but it looks and feels as if it was built in the 1920s.” On that note, we begin! 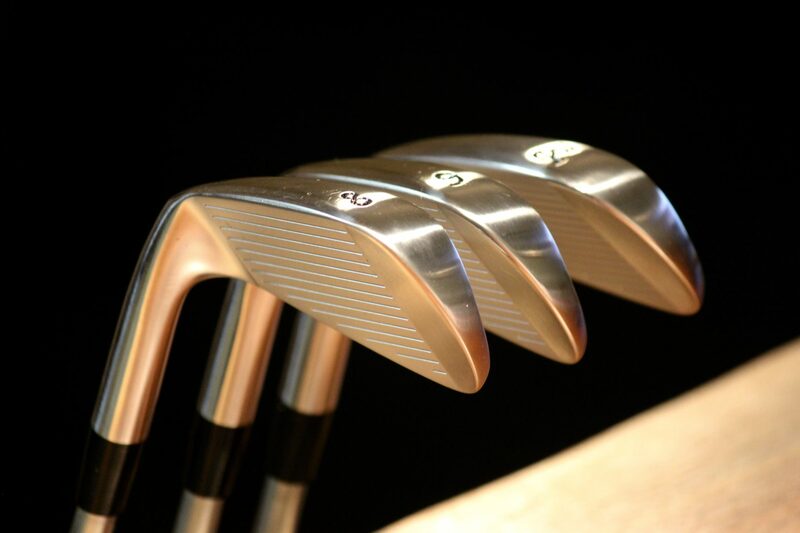 Hole 1 – 348 yards – Right from the start, players understand the treat that lies ahead. A very generous fairway is protected by a single bunker that cuts into the fairway on the left, and a small creek that runs down the right. The green is very large, with the sort of undulation that makes pins on the edges a joy to putt to. I knew from the start that the greenskeeper must have had a rough morning as the pin was on the very back right and I was left with a 50 footer to start the round. Welcome to Meadowbrook! Hole 2 – 548 yards – A wild par 5 that ultimately plays up the hill for your second and third shots; it is a brute. The back-to-front sloping green is so original and yet, so simple. It has a false front, and let me tell you: do not go long! That putt would make even the most confident putter tremble with fear. 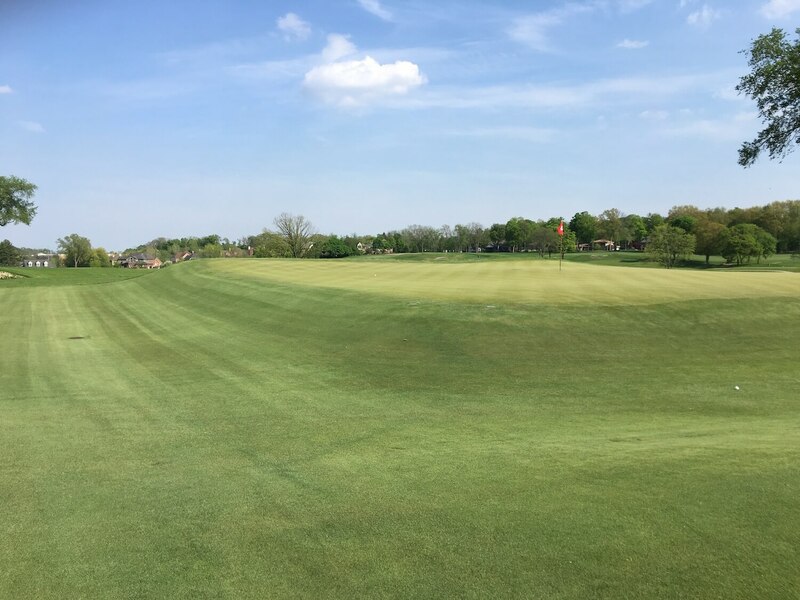 Hole 3 – 351 yards – One of my favorite par 4s on the course, this short two-shotter has plenty of options off the tee as it is not overly long. But play is completely dictated by a green that is hard to describe. The shape is like an upside-down ‘L’, with the long part of the green on the high ground before it plunges into a bowl that represents the short part of the green. It needs to be seen to be believed. Depending on the pin, it may be better to come in from the left, or from the right of the fairway, which is sheer brilliance. Hole 5 – 417 yards – A long par 4, the fairway has beautifully natural rolls that cascade down the hill until you reach a punchbowl green. Players can fly it all the way there, work the ball along the ground, use the banks on the side or take it straight at the pin. There are an infinite amount of ways to play this golf hole. Hole 6 – 158 yards – Wow! That was my reaction when I stepped to the tee. This beautiful par 3 was stellar. With lots of movement on the green, and a knob short right that would either kick balls towards the back of the green, or shoot them to the left, players are left with options on how they want to play the hole. And a special note for the bunker shapes: on the left, you’ll see a ‘U’ shaped bunker that feels so original, just like the rest of the course. Hole 7 – 387 yards – An uphill hole, I liked the approach to this green, which played blind. There are a couple trees behind the green, which help give players a line, but otherwise, don’t come in to play all that much (at least when we played!). Hole 8 – 186 yards – Another stellar par 3, this green sits on a plateau with fall-offs everywhere. The green is two-tiered, but instead of the traditional front and back tiers, this had a high-tier on the left side, and a lower tier on the right. 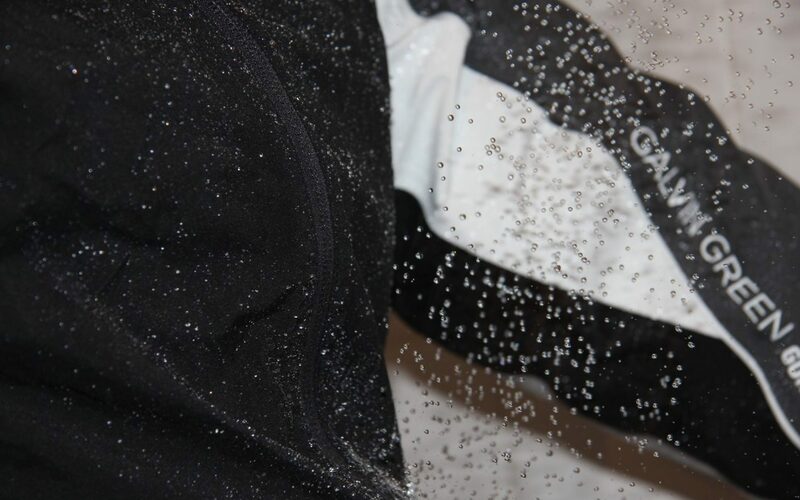 Depending on the pin location it can make some misses smart, and others, downright dangerous. 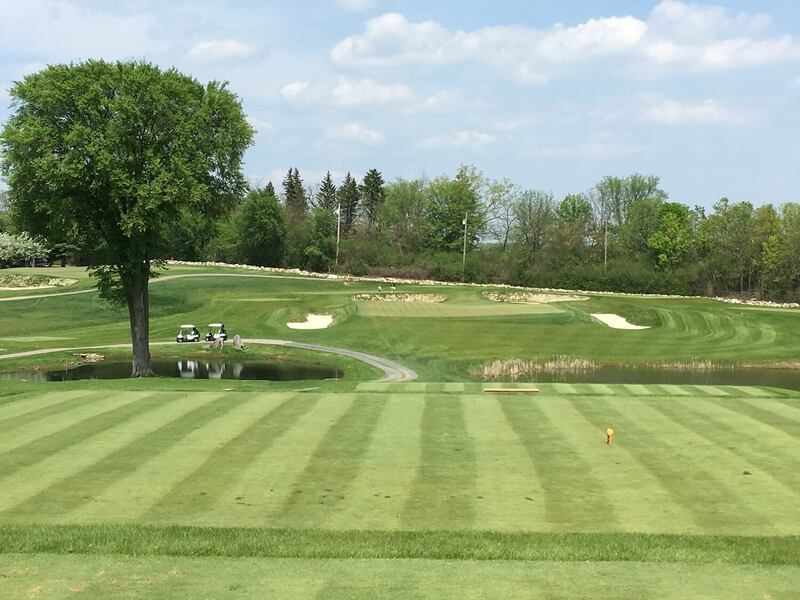 Hole 9 – 324 yards – Is there a better 9th hole in the state?! If so, I’d love to see it! This dog-leg right has cross-bunkers at the corner that cut into the fairway. Players can play safe out to the left, but that leaves them a long approach in, or they can take the bunkers on and leave themselves with a wedge into a sublime green site. 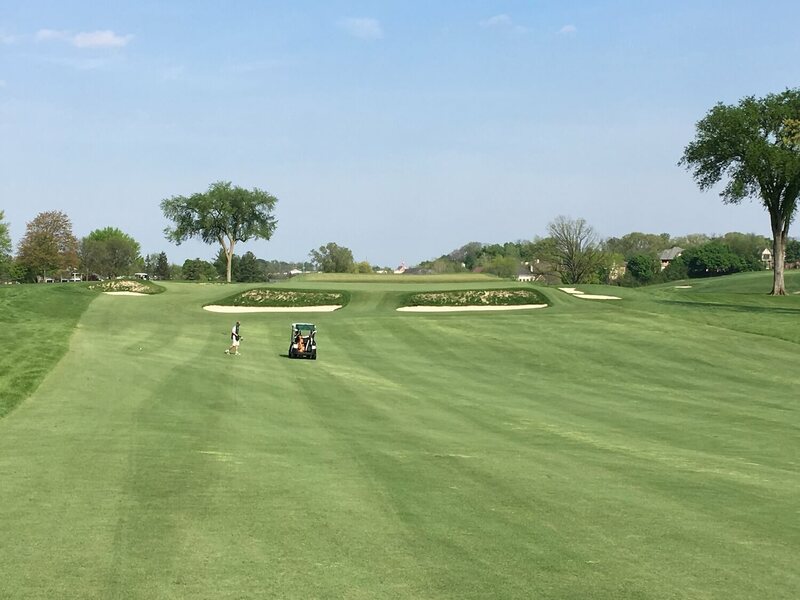 The green has three bunkers as a defense, but the areas around the green are all mowed tight, especially on the left meaning there are lots of options for those that miss the green and the bunkers. Bravo to Mr. Staples for allowing a lot of run-offs, not only on the 9th hole, but throughout the course. 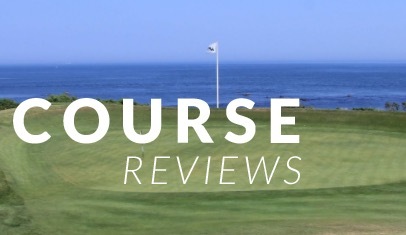 I played my putter a lot because that’s the preferred shot at North Berwick, but I also saw my fellow playing partners play hybrids, wedges and punch shots. 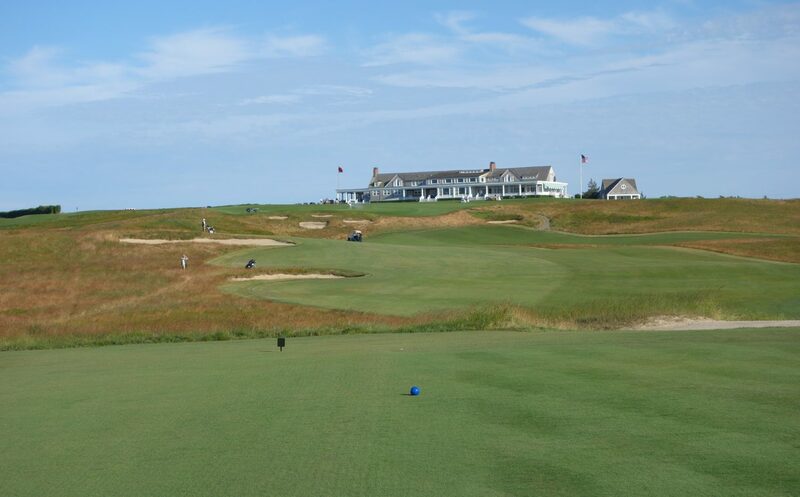 Hole 11 – 194 yards – If the 6th is the darling of the front-9, then the 11th is its mean older brother. On this long par 3, shots are played across a right to left wind with a hungry bunker to the left, ready to dine on the all but perfect shots. 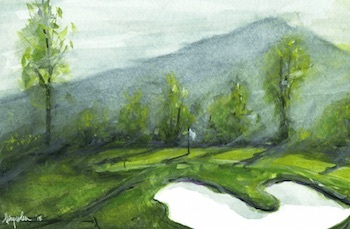 From those bunkers, players are left with a tricky up-and-down shot to a table-top green with massive swales and run-offs on the right side of the green. If you make par here, take your ball and run quickly to the 12th. Hole 13 – 168 yards – The final one-shotter on the course, this lovely hole plays down to one of the lowest parts of the property. In the evening light, with the forest in the background and a pond to the left, it is a pretty cool spot. Hole 14 – 338 yards – Everyone loves a lions mouth green, and I am no different! This par 4 plays up the hill between two giant mounds. 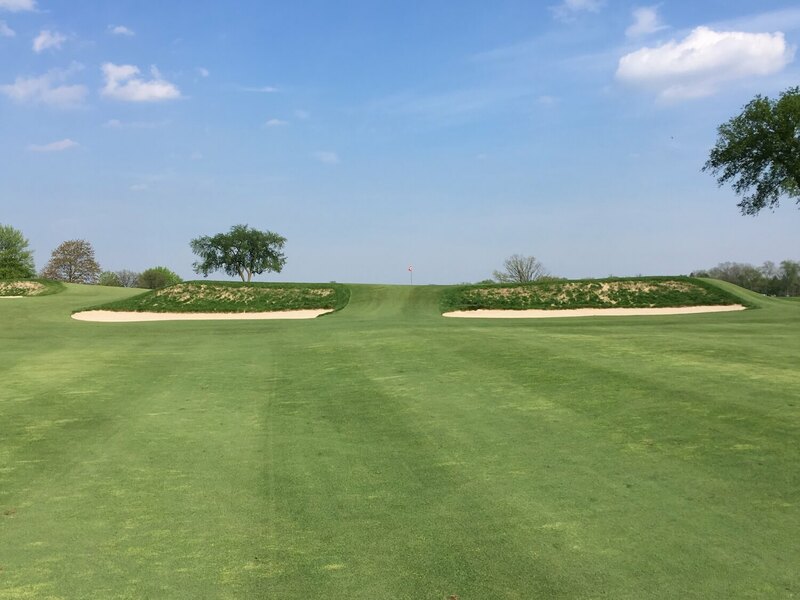 As our host says, pick a side, because inside the mounds offers the most difficult shot as the ball is usually below your feet one way or another. 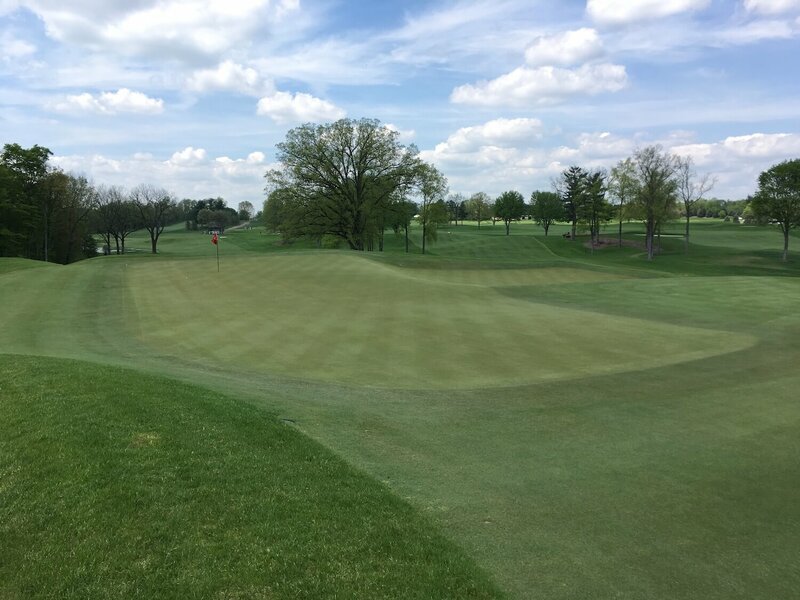 Once players have navigated the fairway, they then get their first look at a green that would be a big square green if not for the bunker cut into the middle-front of the green, which leaves the green looking more like an inverted ‘U’. The pins have been known to be placed on either side of the bunker, making a miss to the opposite side all but impossible to get down in two from. But the rest of the green has some fantastic internal contouring and there is not a dull putt on the entire surface. Hole 17 – 501 yards – My favorite par 5 on the course, the 17th plays down a big hill before rising again for the third shot. There are two spectacle-like bunkers that challenge the Tiger hoping to get home in two. They are 50 yards short of the green, and perfectly placed. 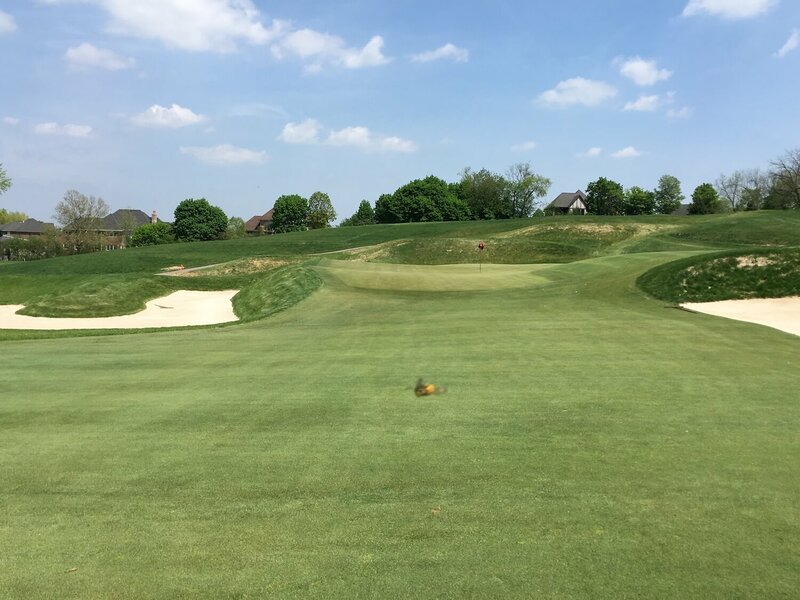 For those who lay-up short, they are faced with a daunting visual, where the two bunkers hide the green and create an almost infinity-looking green (see second photo). This is amazing work by Mr. Staples, and although there is ample room on the green and short of the green, it looks scary! Hole 18 – 417 yards – The home hole, which comes all too quickly. The fairway is well protected by bunkers on both sides but at different yardages. It is tough to pick a line off the tee, and players must factor in the wind and the ground speed before choosing the best line. The approach plays down hill to a wildly contoured green. 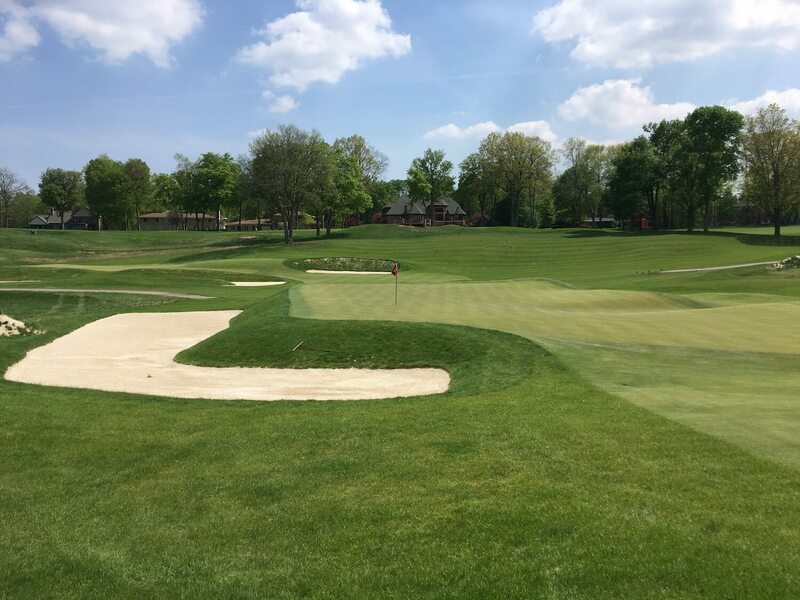 Meadowbrook Country Club feels as if you have just stepped back in time. 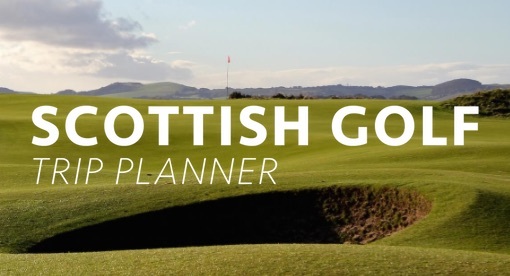 It is a course that feels as if one could look across the fairway and see Bobby Jones in his plus-fours striding alongside his caddie towards his target with fierce determination. As you can tell, I adored the golf course and would put it above many Top 100 golf courses that I have played around the world. 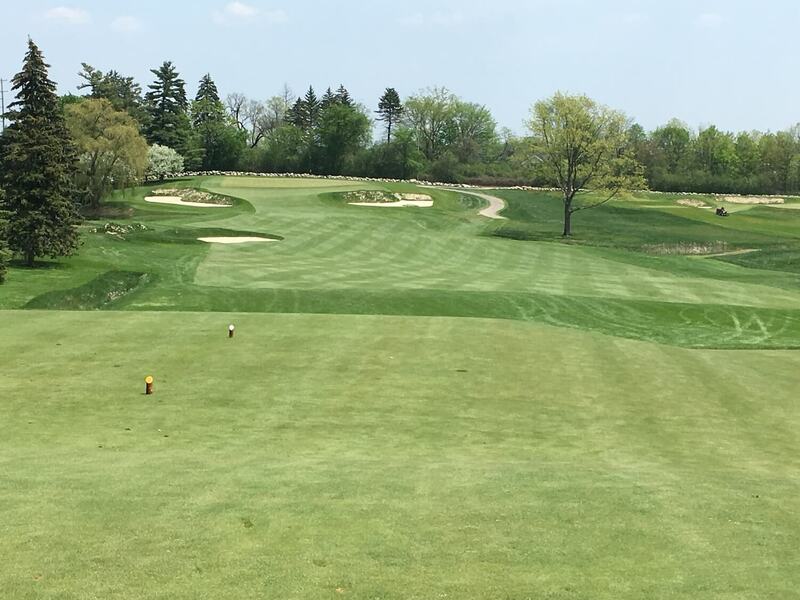 While I didn’t get a chance to play many courses in Detroit, I have heard that it is a rich golf city, with a plethora of great courses including Orchard Lake, Franklin Hills, Oakland Hills and Detroit Country Club. 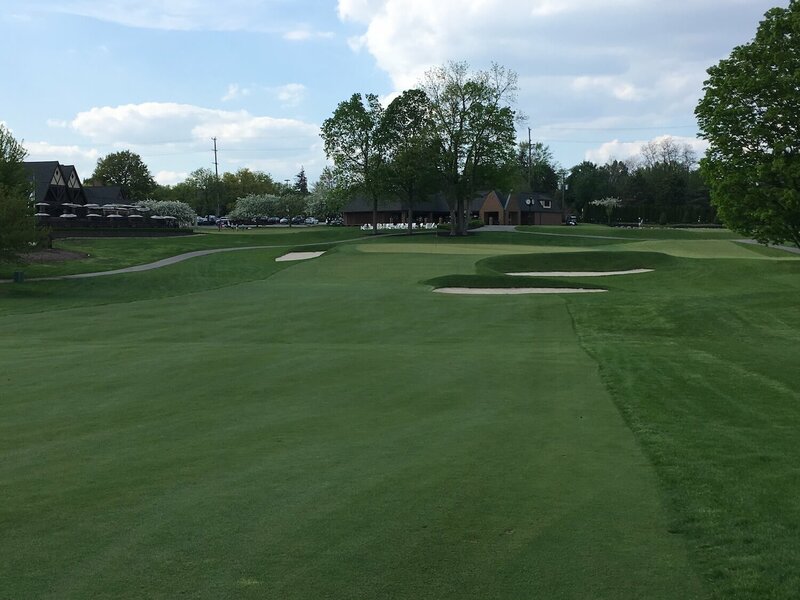 I hope to get back to Detroit, and Meadowbrook someday soon, and until then, I will think fondly back on my round there, and hope the course brings as much joy to its members and guests as it did to me.